In the coming weeks, I will be reviewing a diary in our collection with an eye toward its eventual publication. The diarist is Hedwiga Regina (Shober) Gray (1818–1885), a native of Philadelphia who married Dr. Francis Henry Gray of Boston (1813–1880) in 1844. As diaries are rarely written with an audience in mind, no matter how remote, Mrs. Gray’s diary – in twenty-five volumes, spanning the years 1860–1884 – is full of interesting mysteries about the identities of the people she encounters. When she mentions calling on Sallie G., Mrs. Gray means her sister-in-law Sarah Frances (Loring) Gray (1811–1892), but when she writes of Aunt Sarah, is she referring to her stepmother’s aunt Sarah Fletcher Bradlee (1789–1866) or to her husband’s aunt Sarah Russell (Gardner) Gray (1807–1893)? Is Horace her brother-in-law Horace Gray (1821–1901), the New York merchant, or her husband’s first cousin Horace Gray (1828–1902), the Supreme Court justice? Fortunately, as I read further, I am finding clues to identity that send me back to mark the relevant diary entries, but each page brings new questions. One that had nagged me from the beginning was what to call Mrs. Gray herself. 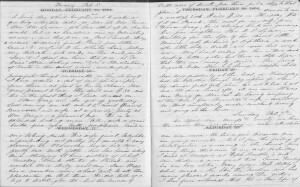 Having read the first three years of the diary, I felt no closer to an answer – and, in fact, Mrs. Gray had a note to herself signed with the initials H.R.G., or Hedwiga Regina Gray. As I was reading the 1862 volume, Mrs. Gray mentioned with diffident pride that she had written an address to her “Sewing Circle” for its twentieth anniversary, which a friend had had published for distribution to the group’s members. Ah ha, I thought, perhaps the publishing history of this little volume will give me a clue about Mrs. Gray’s preferred first name. You ask a great effort from me my dear child when you demand my sympathy and congratulations on your engagement with Dr. Gray. My dear Regina, it is taking from my home, its best comfort, and its brightest light … very bitter, my dear Regina, is thought of giving you up. Regina Shober married Dr. Gray in July 1844, so the letter was probably written in that year. As it happens, Mrs. Gray was the first member of her immediate family to marry; her youngest brother married in 1858, and their sisters married in 1867 and 1868 – I haven’t yet reached those years in the diary, but I feel certain that Mrs. Gray will have a lot to say on the subject! Edward Gray, William Gray of Lynn, Massachusetts, and Some of His Descendants (1916), pp. 16–17, 19–21; Samuel Bradlee Doggett, History of the Bradley Family… (1878), pp. 22, 29. Hedwiga Regina Shober Gray diary, R. Stanton Avery Special Collections, 1861 volume, inside back cover. Ibid., entry for 17 January 1862. Very tantalizing! I do hope it will be deemed suitable for publication. What you describe is very similar to the experience I just went through in transcribing the diaries of my g-g-g-grandmother, Rhoda Caroline Porter Dean. (There is a copy in the NEHGS library). I started out keeping a handwritten list of names I encountered and was pretty much able to identify most of the people mentioned with the help of census and church records, and family lore, after six years of research. When I started the project, years ago, I knew almost nothing about that lineage beyond my grandmother. The years covered are similar (1864-2924)and I also learned a lot about local history and mores of the time–more than I ever thought I would, considering that most of the entries were short and pretty impersonal. Best of luck with your project! So- you Did find out what Mrs. Gray the diarist was called – Regina !! Surely her stepmother would not have chosen to write to her by her middle name if that was not the name used in intimate family circles. ( Well of course she could have been known as Heddy or Reggie-surely not Wiggy- but with such a formal atmosphere as she maintains even in the privacy of her diary, its hard to imagine Dr Gray calling her anything but Mrs Gray, isn’t it. What a fascinating study – please do publish and of course, your cross referenced descriptive index of “who is who” will have to be published as well. Do we smell another PBS Masterpiece theater type saga – not about English social relationships this time, but about 19th Century American manners and mores and social relationships! I am hooked already but I am getting old, so please don’t delay- I want to be around to read it and see it. Isn’t WETA right there in Boston? Call them right away!. Between NEHGS and WETA and you its bound to be a smash. In the mean time I’ll be waiting for Whats in a Name, Parts three and on. Thanks, Dereka, Betsy, and Joanne! Thanks, Scott. This is terrific. I am a Gray, Loring Russell, and Doggett, eg. Daggett. We may be related somehow, somewhere…. I am fortunate to have the diary of my own grandmother for 1910-1911, a pre-printed one with only a few lines per day. This was the year of her engagement. She always refers to my grandfather as “the boy!” She never calls herself by name, either. I have transcribed it, and am also lucky to have my father’s separate transcription from many years before, in which he identifies virtually all the names of people who aren’t family members. The couple also wrote postcards to each other, of which more than 300 survive. From these other sources, plus one precious love letter he wrote her in 1907, it’s clear he called her by her middle name. So, clearly, did the rest of the family. I know this from a family cookbook prepared in the mid 1980s, in which several of her recipes appear, all using her middle name. In fact, of the six daughters in this family, all but one used their middle name. These very private sources tell us so much about our ancestors’ lives. I too would hope your work will result in a book someday. Thanks, Doris, and what a great story! My ancestor is Gottlieb Shober who married Hedwig Regina Transou. They lived in Salem, NC. 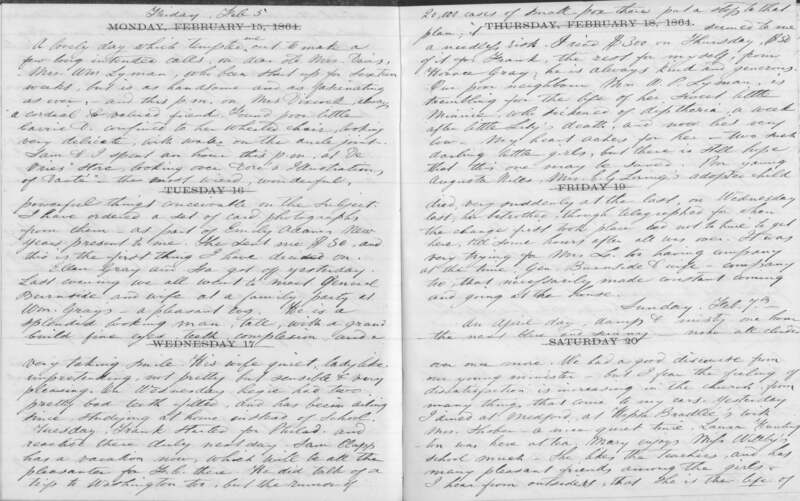 Does this diary refer to any relatives from Salem, NC who might have visited her? Lynette, Not as yet — but I have only read 1860-62 and 1873, so anything is possible!